The hardreading staff gets four newspapers delivered to the Global Worldwide Headquarters every day: Boston Globe, Boston Herald, New York Times, Wall Street Journal. 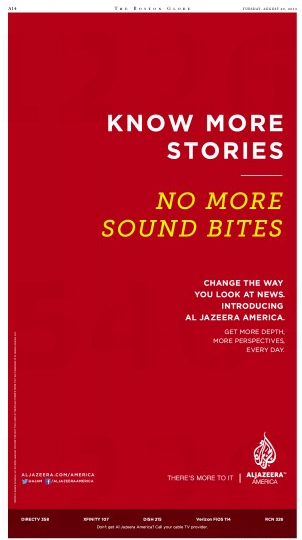 Guess which one didn’t have an ad promoting today’s launch of Al Jazeera America, the Qatar-based news organization that recently bought Al Gore’s ghostship channel, Current TV? The Journal ran the same ad, except with different colors. And this smaller one in the Business section. Of course, this happens to the feisty local tabloid all the time, as the hardreading staff has previously noted. 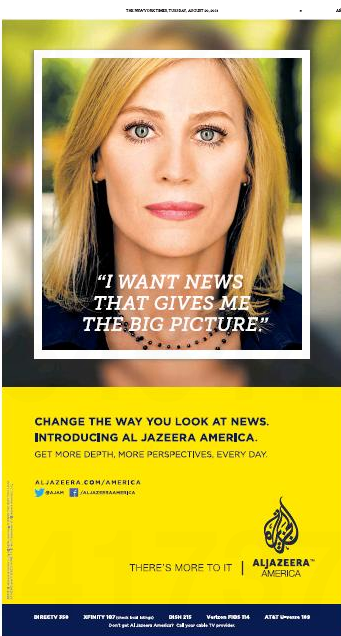 Then again, it’s just possible that the paper rejected an effort by AJAM to purchase ad space. Maybe one of the hardhating Heraldniks who reads this will let us know. 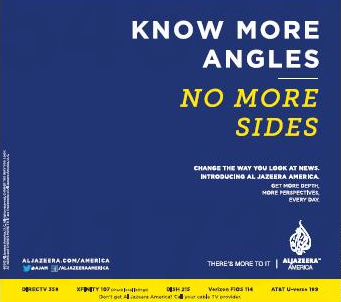 One of the complicating factors with regard to [today’s] launch: it is not clear whether AJAM will have much advertiser support. The channel’s executive team touted its light commercial load leading up the launch arguing that it was a differentiator, but also declined to say who the flagship launch advertiser would be. That, and cable carriage, will likely determine the fate of AJAM. But not in the near future: They’ve got some pretty deep pockets in Qatar, however you pronounce it. This entry was posted on Tuesday, August 20th, 2013 at 5:55 pm and is filed under Uncategorized. You can follow any responses to this entry through the RSS 2.0 feed. You can leave a response, or trackback from your own site.